I can’t afford to use cloth nappies, can I? I have been speaking to a few people recently about reusable nappies and when asked why they decided not to try them there is a common answer: they are too expensive. This week then it is my mission to show how inexpensive cloth nappies can be. Going real saves money for both parents and our communities. For every year a baby is in nappies, he or she will need nearly 2,000 nappy changes. With potty training averaging at two and a half years, that is nearly 5,000 nappies per child! At an average cost of 16p per disposable, between them parents in England and Wales are spending approximately half a billion pounds on disposable nappies every year. I actually agree with this statement but cloth nappies can be expensive. If you were to buy a whole stash of branded and custom nappies then of course you are going to spend a lot of money. Similarly, if you were to buy more nappies than you really needed (ahem might be guilty of this myself) then again it can be expensive. However, cloth nappies don’t have to break the bank. The majority of my stash are what are affectionately known as ‘internet cheapies’. They are pocket nappies which cost around £4 each including inserts. You can get deals on bulk lots and can choose from amazing patterns. As I said, these are the ones we have most of. We then have a few varieties of the branded nappies like tots bots, bumgenius, bambino mio and close pop ins. I find that this system works well for us. The branded nappies were not all purchased brand new either. There is a huge and profitable preloved market. Facebook has groups dedicated to the sale of preloved cloth nappies as do websites such as babycentre. You can pick up brand new and euc (excellent used condition) cloth nappies for good prices. One Facebook page (https://m.facebook.com/profile.php?id=1543623025896312) finds the best current deals so you don’t miss out on a bargain. Although I must warn you – beware the limited edition! If you fall into that trap you may as well remortgage the house and sell your children to buy the nappies. Think that a tots bots royal flush sold for almost £200 on eBay recently and you get the picture! There are ways to do it even cheaper as well. Good old fashioned terry squares and some nice wraps don’t cost the earth and are still very popular even with modern cloth nappies on the market. Local selling pages and sites often have some good deals come up so it’s a good idea to have a quick look once in a while if you are trying to build a stash on a budget. To really keep costs down try not to buy more than you really need. 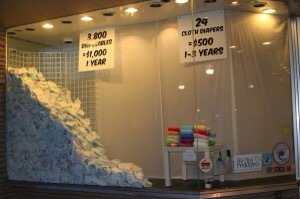 It is advised that a stash of around 24 nappies will be enough to cloth full time for 1 child. I have about 40 in my stash. I could definitely manage on less but I like having more so that I don’t run out if I get behind on the washing!! If you are smart, look for deals and don’t need a full branded stash then you really can cloth nappy on a budget. Have you clothed on a budget? Do you have any tips? I’ve commented here before, but I thought I would again. I use internet cheapies (Alvas) and I think up front I spent $220 for my initial purchases, including cloth wipes (just flannel from the fabric store cut into squares). We have saved SOOO much money and the cheapies are holding up just fine. I wash them in my washing machine and I use the dryer too and so far we’ve had no issues in them holding up. An added bonus is that most of my dipes are in really cute prints. You definitely CAN cloth diaper on the cheap if you want. I haven’t tried Alvas but my little blooms are holding up great as well. Cheapies may be cheap but I have found the quality to be fine. They are definitely addictive! I would love some customs but really can’t justify them at all. I have just managed to get a stash of over 100 nappies of various types and brands for about £150. That’s less than it will cost me a year for disposables and when I’m done I will sell them on to get some money back. Mine are mostly all pre loved, except for my bambino mio which are new but bought off someone so didn’t cost the earth. I bought all mine from a local cloth nappy page. Well done! That is an amazing bargain. Thanks Miranda. I will take a look. I was thinking that I need to have another too so that I can truly get my monies worth!